On Wings of Eagles: Where can one find rest? Suddenly, the floor in front of the stage of that church in Abbotsford, British Columbia, Canada, started to ripple, and before anyone realized it, the floor caved in. The gap left in the floor measure 25' x 25'! Pews, along with the worshipers who had occupied them, fell into the void, to find themselves interwoven in a mess of broken water pipes and spraying water. Security is but an illusion of this world. If church floors can cave in, if planes can crush you into oblivion, if school shootings can occur, if drunk drivers may mistake you for a road and drive onto you, if hospitals think you don't need all of your organs, if your gas begins to leak at home, then anything can occur! 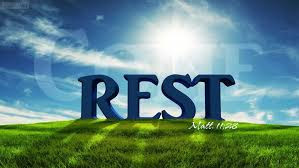 Dear Lord, we thank You that we can rest in You. As we look around us and see all that is going on help us put our complete trust in You and rest. In Jesus’ Name, Amen.